Children and animals go together, but do you know how to introduce your pet in te reo Māori? It’s easier than you think! 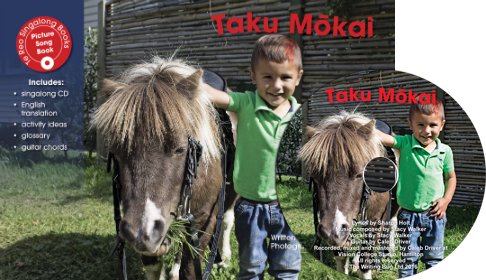 Our Te Reo Singalong book called Taku Mōkai features photographs of five children introducing their animals. This book is a great way to inspire children to use more Māori language in a way that’s authentic and in context. It’s easy to incorporate the book into a study about pets, using the children’s own animals as examples. Each Te Reo Singalong book includes extension ideas and the ideas in this book will be great fun for children in the classroom. They can use photos of their cats and dogs to introduce them in te reo. You could also enjoy a pet day, with some children bringing along their animals. The animals featured in the book are a bird, a cat, a pony, a rabbit and a dog. Each of the five animals is shown over two pages. On the first page for each one, children can learn how to introduce their loved animals in te reo, with two repeated sentences which are easy to learn. One sentence is about the type of pet and the other is about the name of the pet. For younger children, this simple page for each animal is sufficient. For older children, the second page about each animal extends the teaching a bit further. On these pages, the children explain what they do for their pet – including brushing its coat, giving it water and food, and cleaning its cage. Children love the photos of the animals, and will quickly learn how to talk about their own pets in te reo Māori through the easy sentence structures and catchy tune. The song even includes sound effects!